Out Of Clout: Some States Brace For Washington Power Outage : It's All Politics A handful of states are about to lose decades of clout and seniority in Congress. Which one will be hardest hit of all? 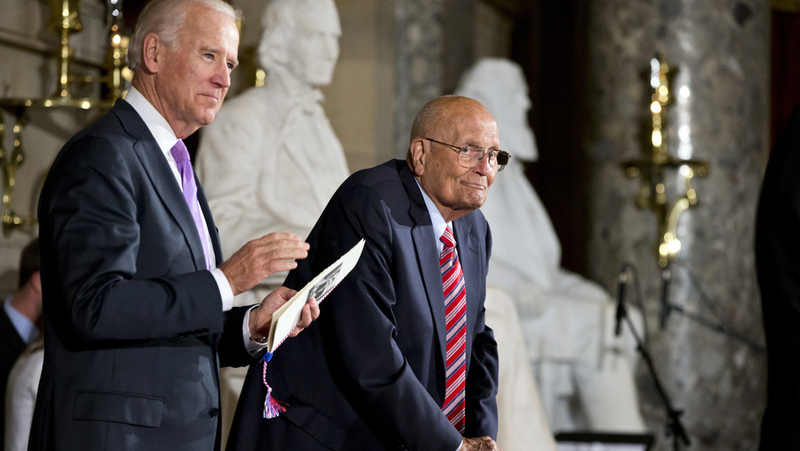 Rep. John Dingell, D-Mich., the longest-serving member of Congress, is celebrated by colleagues, including Vice President Biden, on Capitol Hill in June 2013. A former chairman of the Energy and Commerce Committee, Dingell, now 87, announced in February that he will retire after this term. When the next Congress is sworn in, Iowa's congressional delegation will be unusually green. Precisely half of its lawmakers on Capitol Hill are retiring at the end of this session, meaning the state will be losing decades of clout and seniority in Washington, D.C.
And Iowa isn't even the biggest loser this year. California is losing two House Democrats with 40 years of experience each — Henry Waxman and George Miller — along with Republican House Armed Services Chairman Buck McKeon, who's been in Congress for more than two decades. The state that will be hardest hit of all, though, is Michigan. It's losing three powerful committee chairmen (Democratic Sen. Carl Levin, along with Republican Reps. Dave Camp and Mike Rogers), as well as Democratic Rep. John Dingell, the longest-serving member of Congress in history. "That's a huge kind of psychological blow," says Jeff Williams, CEO of Public Sector Consultants, a non-partisan think tank in Lansing. "It's one more kick to the gut of the psyche of Michigan." There's also a more practical effect. Each of these states will now have fewer wily old members with the knowledge and wherewithal to steer money back home and bend the policy process to their will. "Tenure and seniority play just an amazing role in the ability of those folks to get things accomplished," says Bill Peterson, executive director of the Iowa State Association of Counties. Iowa is full of schoolhouses that are 50 or even 100 years old. Many are still perfectly sound but have become deficient in terms of modern fire safety standards. School districts in Iowa are in luck, however. Over the past 15 years, they've received more than $130 million in federal money to help pay for sprinklers, fire-resistant doors and heat-detection systems, as well as other construction projects. The money comes courtesy of Tom Harkin, a Democrat and a longtime fixture on the Senate Appropriations Committee. Payments have even come to be known as "Harkin grants." "I don't know where we would have come up with the money, if it wasn't for the Harkin fire-safety grant," says Dianne Anderson, superintendent of the East Marshall Central School District, which will be retrofitting some buildings once the school year is done. "The districts really count on this, to assist us in the changes." But now Harkin is preparing to step down, after 30 years in the Senate. He's not the only Iowan calling it quits on Capitol Hill. Democrat Bruce Braley is giving up his House seat to run for Harkin's, while Republican Rep. Tom Latham — a good pal of Speaker John Boehner's — is retiring after 10 terms. "Obviously, when you lose someone with the tenure of a Sen. Tom Harkin, it's gonna have an impact on the state," Peterson says. Michigan currently has nine members with a decade or more experience, each of whom served as a committee chairman or ranking minority member. By contrast, next year at least 10 of its members will have been in office fewer than five years. Michigan is losing nearly half of its congressional experience in one blow — a combined 134 years of experience, out of about 300 for the delegation as a whole. It's not alone in suffering a sudden loss of clout in recent years. "They used to have a joke in Hawaii that there were three industries — the military, tourism and Daniel Inouye," says Donald Ritchie, the Senate's official historian. Inouye, a Democrat and longtime appropriator who represented Hawaii in the Senate since statehood, died at the end of 2012, just before the state's other veteran senator, Daniel Akaka, left office. Now Hawaii's senators have a total of just over two years' combined seniority. Similar stories about recent rapid decline in experience and seniority can be told about Massachusetts and South Carolina. "States invest in senators for that reason, to make sure that they can get a share of whatever the federal government is doing," Ritchie says. It would be easy to argue that seniority matters less than it once did, so a sudden power outage isn't quite as devastating as it might have been years before. Committee chairmen are not the barons they once were, now that most important legislation is being steered out of leadership offices. There's less legislation moving, anyway. And Congress has pretty much done away with earmarks, which readily allowed members to direct federal funding to specific projects back home. "If you're not passing legislation, it's hard to say what you're being able to produce for your state," Ritchie says. Even so, seniority still matters. There's a reason the currently stalled federal transportation bill would fund a new interstate highway linking Las Vegas to Phoenix — Harry Reid, the Senate majority leader, hails from Nevada. "It does matter that senior people leave," says Stanford University political scientist Bruce Cain, "not because the state will get more or less revenue, but because they had influence over leadership or on policy." The bigger problem, in other words, is not that some states will end up disappointed about receiving smaller shares of the federal pie, but that barely functional legislative bodies will lose more members who used to know how to get deals done.